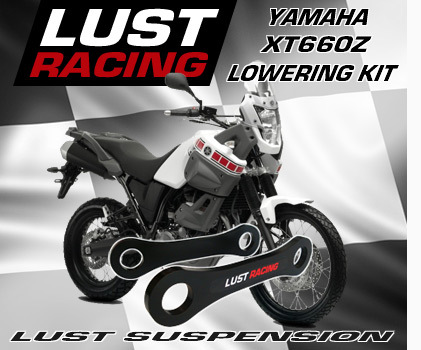 Lowering kit for Yamaha XT660Z Tenere by Lust Racing. Lowers the rear suspension and the seat height on the XT660Z Tenere. The kit includes new steel suspension links that replace the stock links on your XT660Z Tenere. We offer a lowering kit for the Yamaha XTZ660 Tenere that lowers the seat height. New, younger and shorter riders find that the lowered bike is easier to handle. Lowering the bike spurs confidence and reduces riding errors as a result. By fitting a lowering kit for your XTZ-660 Tenere you no longer need to tip-toe in traffic lights. A lowering kit increases high speed stability and improves rear wheel traction. The latest Yamaha models have relatively high seat heights, most normal length and shorter riders will find the Lust Racing lowering kit for the Yamaha Tenere XT 660Z a great improvement over the standard bike. While 40mm may not sound like much this lowering provides a remarkable improvement for shorter and normal length riders. If you prefer you may lower the front forks to keep the handling neutral following the instructions in the installation instructions provided with the lowering kit.